Persimmon season is almost over, here in our yard. We've been enjoying them and sharing them with neighbors and family. 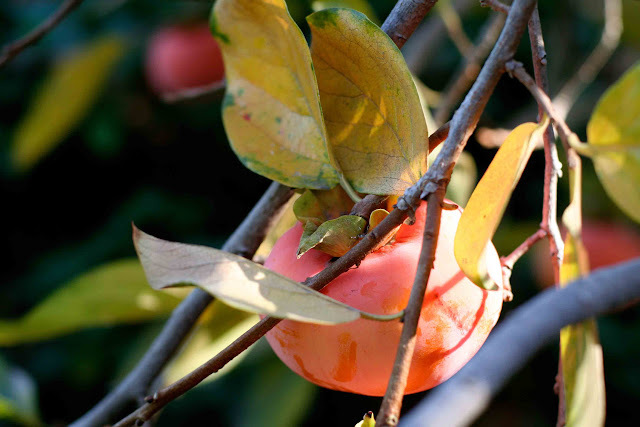 This is the Fuyu variety--it's "the flat one" that you eat when it's hard, like an apple. This is our little tree. I brought it home from the nursery about three years ago--and my husband Gary planted it in the corner of our side-yard, next to a dead avocado tree. 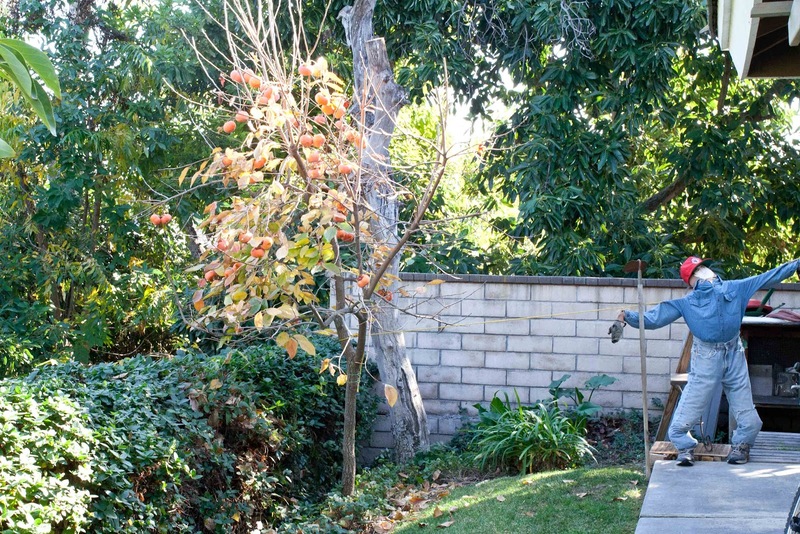 I tend to buy fruit trees on a whim, and count on Gary to plant them for me...and take care of them, too--which I'm grateful for that he does. 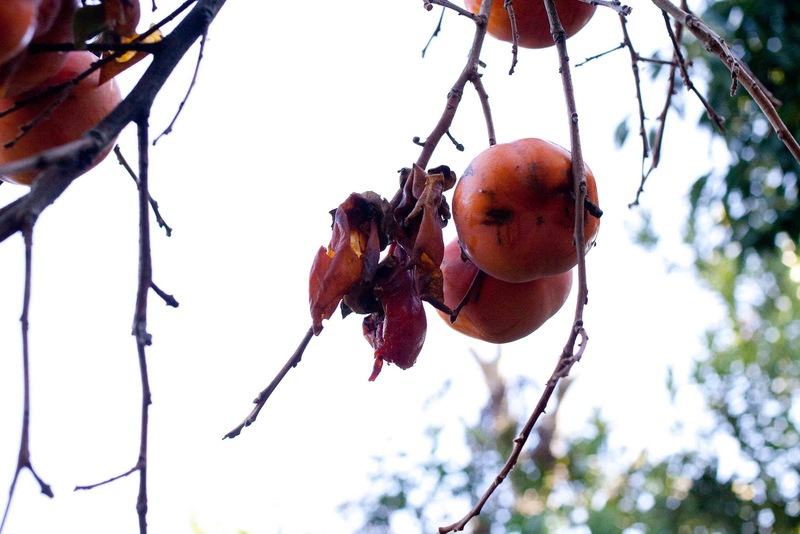 The birds and the squirrels like persimmons too. 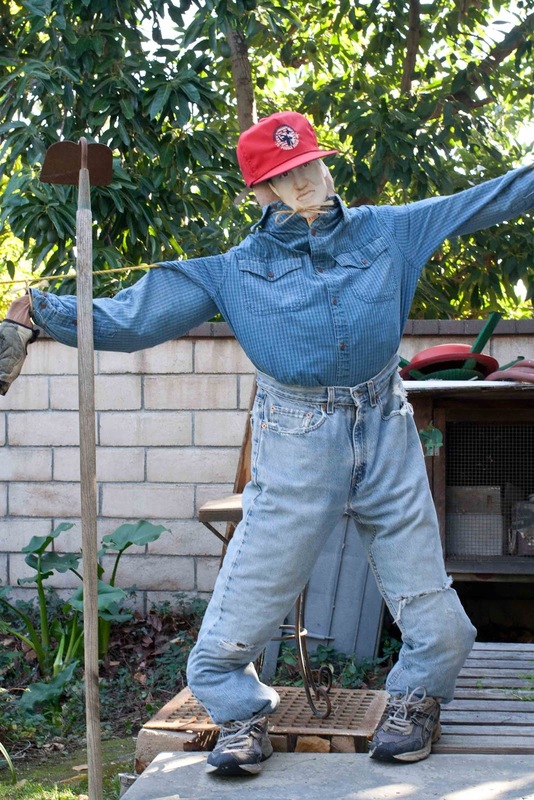 Gary decided he needed to make a scarecrow to keep them away. Not to be confused with CO2 on the right. That's my nephew Colin on the left. 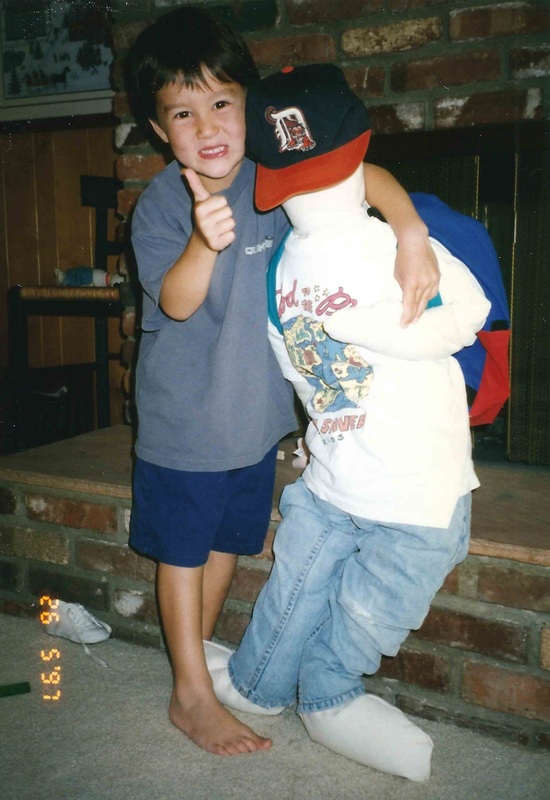 When he was little he gave himself the nickname C.O. CO2 was a school project when Colin was in pre-school. 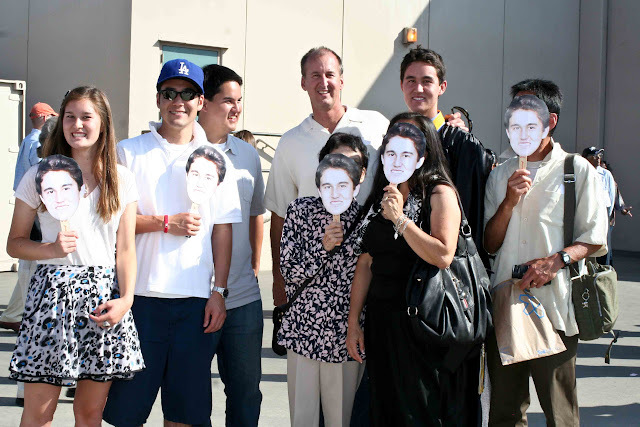 We made these Colin fans when he graduated from high school, so one of those became the scarecrow's face. 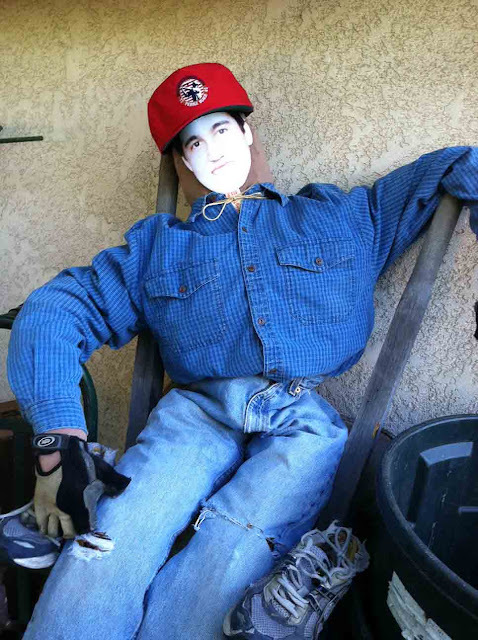 CO3 is well taken care of--Gary takes him down in high winds or rain--if it was left to me, I would most likely forget and CO3 would be a mess by now--drenched and/or blown apart by the Santa Ana winds. Dixie was wary of CO3 at first and barked and barked. 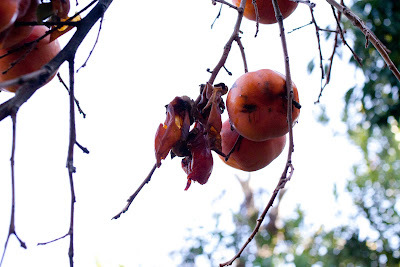 But I'm not sure if he's doing his job, the persimmons still get eaten. Even the birds and squirrels don't eat the skin. 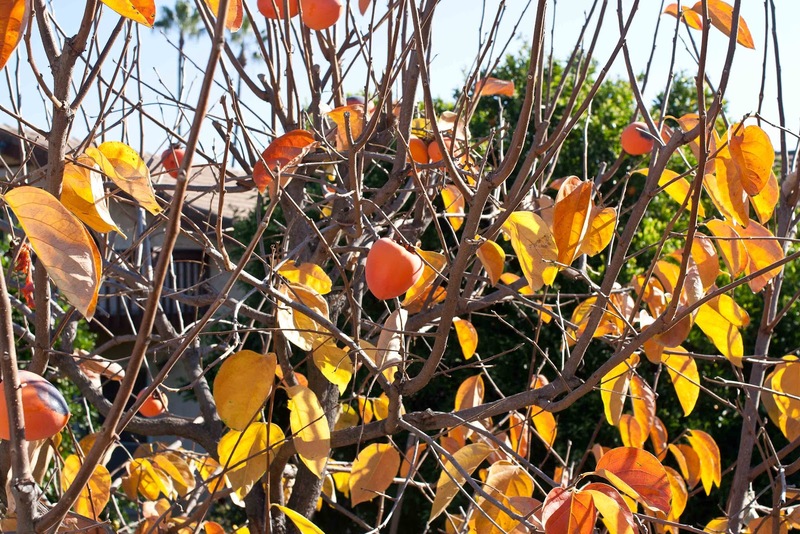 This is my neighbor Sam's kaki tree. 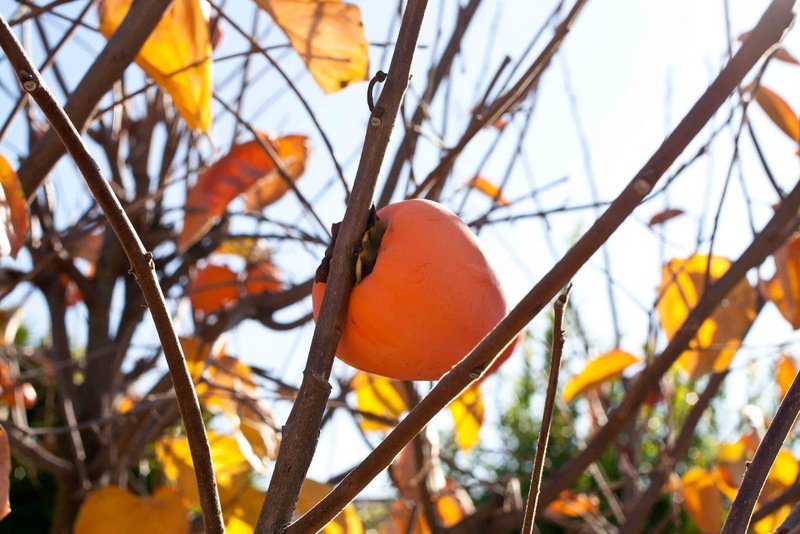 Kaki is persimmon in Japanese--I always call them kaki. Sam's got the Hachiya variety of kaki. It's "the pointy kind" that you have to eat when it's soft. If you eat it when it's hard, it feels like you have prickly thistle-like hairs sprouting from your tongue. Don't eat this kind when they're not ripe--believe me--I found out the hard way! 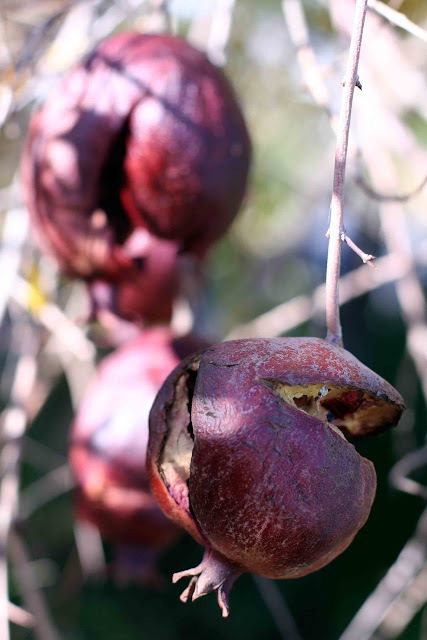 The hachiya kaki is eaten when it's soft, like a ripe avocado. Or eat a hachiya like this--dried. My friend Carol dries them and they're so delicious. 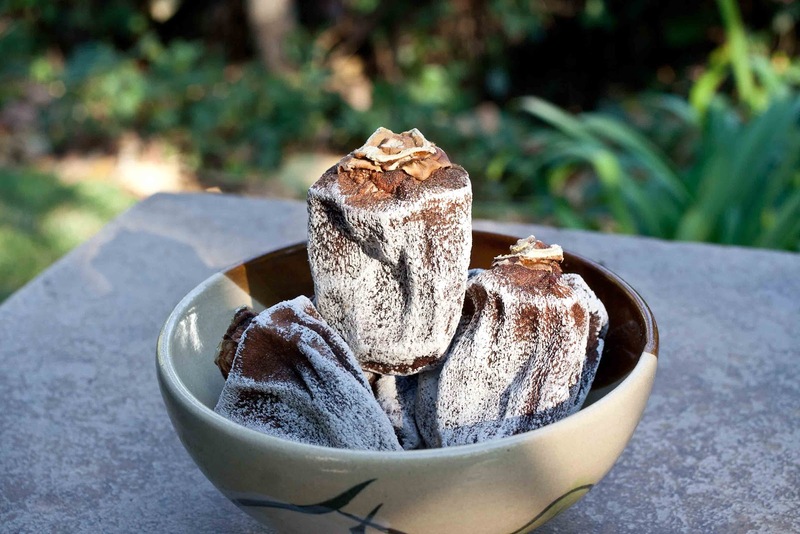 Click on the link for a nice video about Otow Orchard, a family that grows and dries kaki in Granite Bay, California. 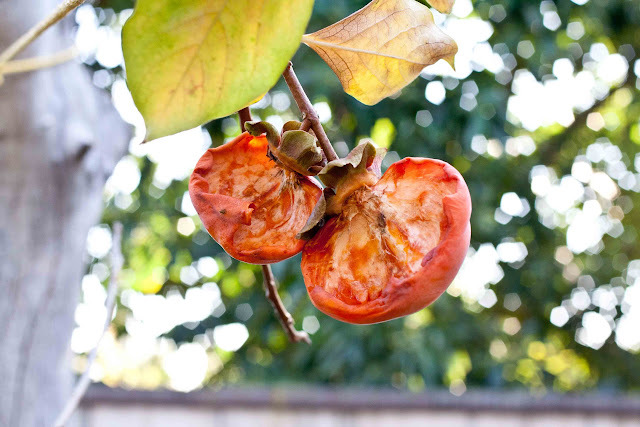 Carol dries hachiya persimmons similar to this method--she peels them, hangs them in the sun to dry and massages them so they'll be soft. That's natural sugar on the outside of the dried kaki--they're so good we wait for them all year. 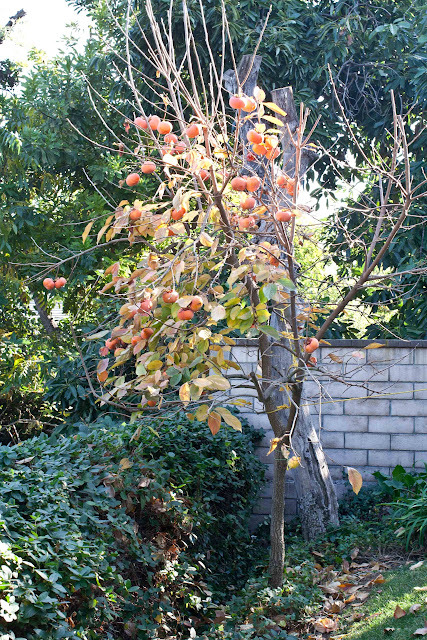 Our kaki tree is planted on a small slope--Gary was up in the dead avocado tree picking the fruit when his ladder fell. I was in my sewing room working at crafting when he called my phone for me to come outside. Isn't it wonderful to have a video camera handy, right on your phone, to capture life's little surprising moments? My neighbor Hiro's pomegranate tree. 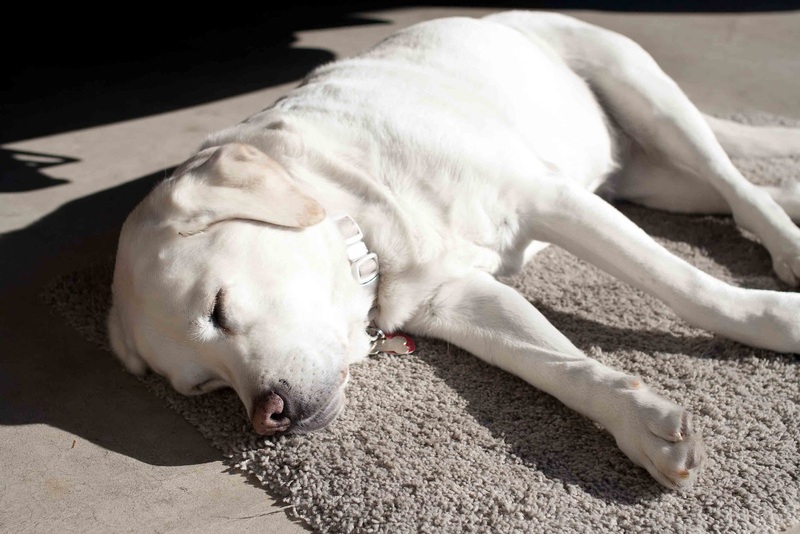 And Dixie basking in the warm morning sun. Love the pics, Karolyn. Mellow autumn. wow-- glad Gary was on the tree and not on the ladder!! AND he had his cell! Love the fruits of your backyard! We used to get kaki from my Uncle Shig and Auntie Sugi in Lincoln. Now my Auntie Sumi and Danny preserve kaki. We visited a few years ago and it is great to see my Auntie so busy with this labor-intensive work. My great grandpa used to have a persimmon tree, so some of my earliest memories are of my sister and I eating fresh persimmons at his house. My mom also used to make persimmon cookies with them every year, so now that is a common baked good in our family. We always look forward to persimmon cookies!